One of our family friends Merania and my nurse Jan made arrangements with the Make-A-Wish foundation and a trip to Disneyworld was organized within a week. The local newspaper ran a front page story about our family and the community support was amazing. There were hundreds of phone calls and cards from people offering prayers and encouragement. The day of the trip arrived quickly and there was a large crowd at the airport to send us off. It was the first time I had ever flown in an airplane and it was really exciting. First we flew on a smaller plane to Salt Lake City and then we boarded a huge plane that could fly all the way to Florida without stopping. Mitch and I took our backpacks on the plane and they were full of books, crayons, toys and treats that people gave us for the trip. While we were flying we could get out of our seats and walk around, that was so cool. I would walk up and down the aisle with a big smile on my face because it was like walking on air. There was a little boy a few seats away from us that was not having very much fun. I asked mom if I could share my things with him and she okayed it with his mom. I spent the rest of the flight playing with my new friend. When we landed in Florida his mom thanked me for making the flight better for her son. It was nothing; I think he was just scared to fly. As we walked into the terminal there was a large banner hanging from the ceiling that said "Welcome to Florida Brock Walquist Family". We were really surprise and all the people from the flight were watching us as we were met by Make-A-Wish representatives. The lady from the flight asked mom what was going on and she told her that I was a wish kid and that we were in Florida on a granted wish. She asked why and mom told her that I had terminal cancer. The lady started to cry and said she should have been the one comforting me, but I helped her. I was just having fun with a new friend. We stayed right at Disneyworld in a resort that had a monorail that would drive right through the hotel. Mitch and I were able to ride in front with the driver and we saw everything, it was so fun. During the week we rode on all kinds of rides and I liked Thunder Mountain the best. It felt like I was flying when I held my hands high in the air while the ride went down the mountain and twisted and turned. Mom was worried that I would fall out so she hung on to me really tight. Mitch and I were able to get autographs from all our favorite characters, Buzz Lightyear, Winney the Pooh, Tigger and many more. Minnie Mouse signed my book and even put hearts by her name. They gave me a button to wear that let our family go to the front of the line on every ride. My parents felt like they were crowding in front of everyone, but as the day and week progressed they saw how tired I was getting and they were grateful for the privilege and opportunity to see as much as we could while I was able. I wasn't tall enough to ride a dinosaur ride at one of the parks and Mitch really wanted to ride it, so dad and mom took turns riding it with him. 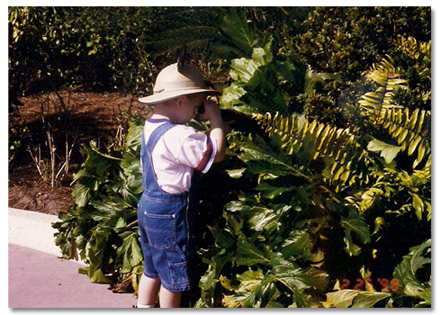 When dad was riding the ride with Mitch mom let me use Mitch's binoculars and I pretended that I was looking for dinosaurs in the bushes. When my parents' switched dad bought me some ice cream, so it worked out great, Mitch was able to ride his favorite ride several times and I got to search for dinosaurs and eat ice cream. 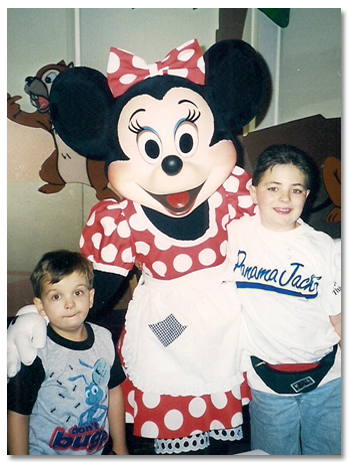 Disneyworld and Universal Studios were so cool; we saw 3D shows that were really funny. In one of them bugs were in the studio and in another one a snake scared mom. One ride that I didn't like was Jaws; it really scared me when the shark was next to our boat. 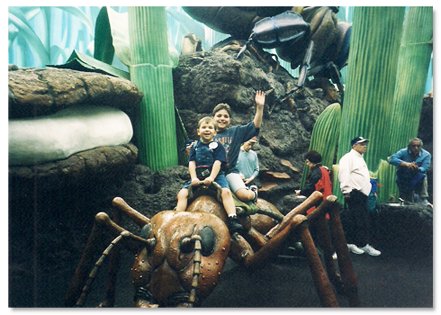 My favorite area was the Bug's Life Park; everything was so big that I felt like a bug. We were able to go to the Race Rock restaurant where they had real race cars inside and all kinds of racing gear. We also went to a King Arthur's birthday party inside a castle. Mitch and I had so much fun dancing on the stage and celebrating the king's birthday. On our last day in Florida we went to Sea World. At the park we were able to feed stingrays. I was nervous at first because I thought they would bite me, but dad showed me how to hold my hand to feed them and it was exciting, they felt like big pieces of rubber. The seals would bark really loud so that we would feed them. They made us laugh and Mitch and I would try to sound just like them. We saw people who would ride on whales and swim with dolphins and then while we were watching the show the biggest whale splashed us and we were all wet. I had never been splashed by a whale before and it was so much fun. The week went by so fast; we had a wonderful time and took a bunch of pictures. It felt like we were living in a fantasy world where there were no problems. While we were experiencing the vacation of a lifetime the tumor was growing at an alarming rate. In one week it more than doubled in size. We flew home from "The Happiest Place on Earth" to a harsh reality.